Come and share the “tablas” in the very same place where the world famous Camarón de la Isla performed for years.Torres Bermejas offers its clients the possibility of experiencing the art of the flamenco world first hand, via our “Masterclass “.In these lessons, of 1-hour of duration, you will be taught and guided by professionals with an outstanding knowledge and mastery of the flamenco art. Torres Bermejas, opened in 1960, is the most important and unique flamenco show in the world. Torres Bermejas is unique for its stunning room that reproduces inside the Bermejas towers of the Alhambra in Granada, with walls with Arabic motifs, tiles and wooden covered ceilings. 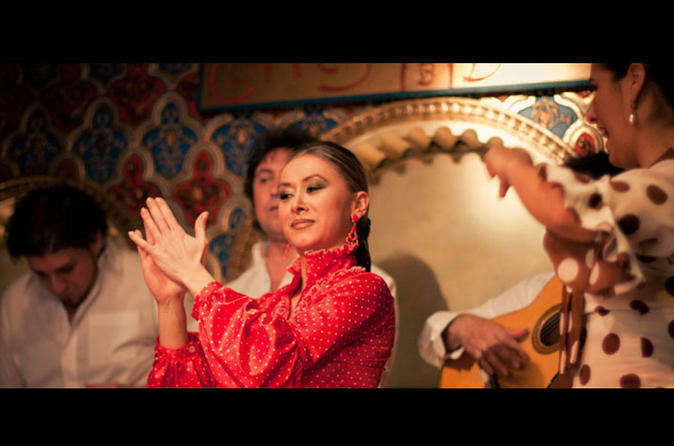 When you come to the flamenco show, it is an unforgettable artistic experience by the Cuadro Flamenco composed of the best artists from singers, guitarists, clappers and dancers. The flamenco night will be complete with dining unapropuesta inspired by traditional Spanish cuisine, very innovative touches and the dominating product quality. Enjoy a memorable artistic history with the launch to fame of the greatest flamenco in recent times. Camarón has acted here for 12 years and where he met guitarist Paco de Lucía. Manolo Caracol, which debuted on February 1, 1962 and most recently the singer José Mercé, have also gone through our tablao seeking fame and recognition. Artists like The Güito, Mario Maya, Chunga, Fosforito, Pansequito, Enrique de Melchor, Paco Cepero, Chato de la Isla and more recently, the young guitarist Juan Habichuela Nieto have performed. The flamenco show Bermejas Torres is in the historic center of Madrid, next to Gran Vía and Callao. In the same room, occupies the oldest tablao of Madrid, La Taberna Gitana, which opened in 1949.